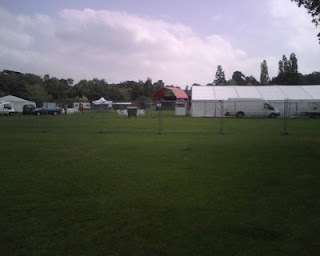 After over a year of planning it's only just over an hour until the start of Hope in the Park. 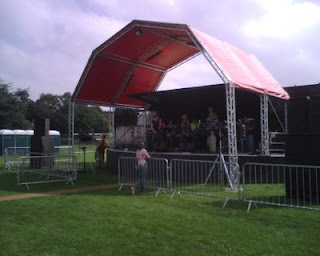 The site looks great, I hope the photos do it some sort of justice. We've got a site license for 2,000 people so I'm praying that we'll have far more than that over the course of the event. Oh and the weathers brilliant - a miracle in itself! 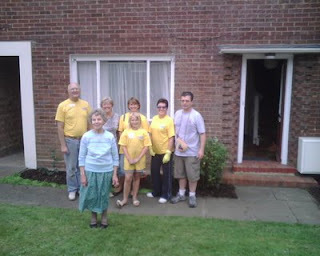 On Thursday our family was involved in another Hope Bracknell project, doing the front and back garden of one of our Kerith members. The lady in question is one of the sweetest people I know, with a real passion for people and for prayer. It was a real privilege to help her and wonderful to see her joy at her reworked garden. 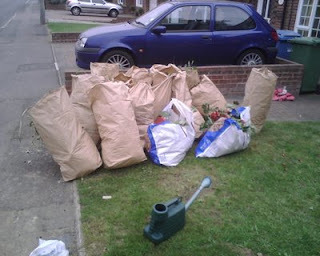 Unfortunately I've only got 'after' photos, but hopefully the picture of all the bags of garden waste give you an idea of what hard work it all was! The feedback on the over 50 Hope projects which have taken place this week has been very encouraging, and the buzz around the team has been growing throughout the week. 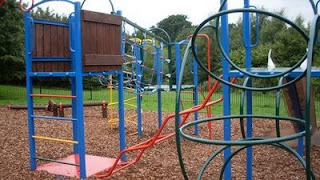 I hear the setup in South Hill Park has also been going very well, despite the late delivery of the fences and various other bits of the kit required. We should be in for a great day tomorrow so hope to see you there. Don't forget we're meeting there on Sunday morning as well, and that there's no evening meeting this weekend. The blog title comes from one of my favourite books by a guy called John Burke (he's one of the speakers at the Willow Global Leadership Summit in Bracknell in October and isn't to be missed). It came to mind when I heard of events surrounding a couple of things I've blogged on in the past which I felt I wanted to comment on. The first relates to Todd Bentley, the guy at the centre of the Florida Revival. I'm not going to go into the details, you can read a statement from John Arnott about it here. The second relates to Michael Guglielmucci, the man who sang the song Healer on the latest Hillsong album. It turns out that he never had cancer - you can read a statement made by his Dad about that here and a newspaper article about it here. So what to say about all of this? My first reaction was one of shock and disappointment that these sorts of things continue to happen, and the impact they have not only on the church but on the name of Jesus. Not good. Secondly let's remember Jesus words in John 3:17 - "For God did not send his Son into the world to condemn the world, but to save the world through him". If Jesus didn't come to condemn people then we mustn't either. Rather than picking up our stones to throw them at Todd and Michael we need to realise that all of us have sinned - it's just that theirs was far more public than any of ours will probably ever be. Let's be praying for Todd and Michael, their wives, their families and the many people who will be impacted by what they have done. Thirdly that things like this are a wake up call to all of us to watch our own lives and make sure we aren't also being hypocrites or living a lie by saying one things and doing another. It doesn't matter whether you're a brand new follower of Christ or a leader of a church of thousands, people are watching the way you live and will be positively or negatively impacted for Jesus by the way you live. I joke about 'fine' never being an acceptable answer to the question 'how are you'. We need to have people who hold us accountable to make sure as far as possible we live without any masks or pretence and never pretend things are OK when they aren't. If as you read this you know there's any point where what is really happening in your life is different to the image you're trying to project, then repent straight away and tell someone you can trust as quickly as possible. Finally we need to make sure our eyes and our confidence are fixed on Jesus and not on people. People will always let us down, God never will. When I heard about the deception over the song Healer one of my first thoughts was would I feel the need to delete it from my iPod. At first I did, but the more I've reflected on what has happened the more the song has grown in significance for me. Some of us need a physical healer, but all of us need a healer who will take our spiritual and emotional brokenness and put us back together again. As I think of the video of Michael Guglielmucci singing that song with all the oxygen tubes and everything else going on, I realise the somewhere deep inside he was crying out for a healer for the brokenness he felt inside - the same healer you and I need too. I hope you find all that in some way helpful in terms of processing what has happened. 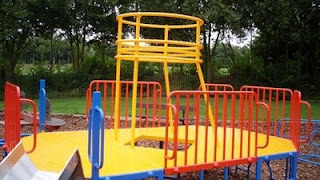 I spent most of today in Westmorland Park in Warfield with a big team repainting the playground equipment. We had an absolute blast, although I think it will take weeks for all the paint to come off my daughter Alice - I'm sure she had more paint on her than there was on the equipment by the end. It was really hard work but the final result was quite amazing. Take a look at these photos and see what you think. There's been very good feedback from other projects too. Some inevitable teething problems and difficulties but the teams have just had a real 'can do' attitude. The weather is looking good for the weekend too so I think we're in for a great rest of the week to come. I also approved the promotional booklet for our HIV and AIDS initiative today which is looking very good. If you're there when we launch the initiative on the morning of the 7th September with Lynne Hybels you'll get to see it then. I love it when planning turns into action. Back now in the land of technology after two glorious BlackBerry free weeks. We had a great time on holiday as a family, four days in Paris and then a week in Brittany and I feel more refreshed, connected with Catrina and the children and excited about the God adventure that we're all on than I have in a long time. This morning was very exciting with the kick off of Hope08 - after over a year of praying and planning it's great to finally be doing something. I went to the breakfast and prayer time at Easthampstead Baptist this morning but haven't been involved in any projects today as too many people had signed up - I didn't think we'd be saying that a couple of months ago! There was a real buzz about the place so I hope the projects are going well today. I'm doing projects Tuesday and Thursday this week - hope to catch you at either one of those, or at Hope in the Park on Saturday or the joint churches meeting on Sunday. Let's be asking God for him to break in powerfully over the next week and for many lives to be changed. I'm writing this in the passport control queue at Heathrow, having just landed back from Chicago. The lights of London are a beautiful sight in the dark. Our final full day in Chicago was excellent. In the morning we chose the DVDs to be shown at our version of the Summit (you won't be disappointed). Then on Saturday evening we went to the church service at Willow. Henry Cloud who some of you may remember from past Summits spoke and was very good preaching on grace. At the end we got to meet the Hybels family. Ben and Mo caught up with Bill Hybels. Catrina got to meet his daughter Shauna who has written a book called Cold Tangerines which is all about enjoying the little things in life and I'm told is very good. And I managed to talk to Bill's wife Lynne all about her visit to us on the 7th September which was very helpful - I'm so excited she can be there that morning as we launch our Zambia HIV/AIDS initiative. We're now off on holiday for two weeks, leaving far too early tomorrow morning! I'm going to leave my BlackBerry at home (I'm feeling the withdrawl symptoms already) so no blogs for two weeks. A technology free two weeks will do me a lot of good! Hope you're having a great summer and catch you all when I get back. 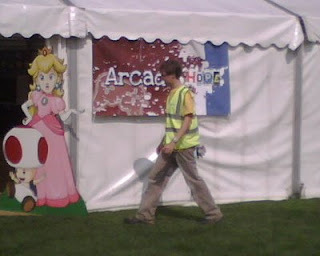 The photo of the youth I meant to include in my last entry didn't seem to make it, so here it is again. Hope it works this time. Whilst at Willow today I got a text from Lee who's with the youth at RockNations in Bradford to say that our youth band, Ethos, won the battle of the bands competition. Given the number of big youth groups there that's a major achievement - I'm so proud of them, and of our young people in general. 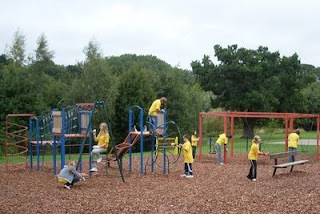 The picture was sent to me by Edward Olugbile - you may be able to spot some of our youngsters in it. So much for quiet summers! 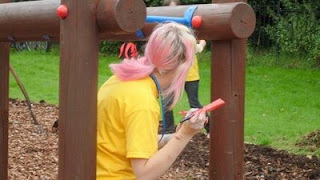 We've already had the Oakwood childrens camp, kids respite, youth respite, RockNations and Willow. 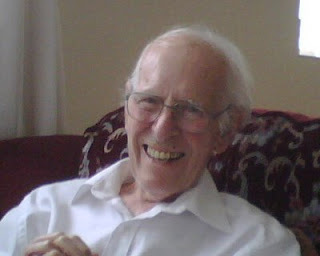 Still to come are Don Smith morning and evening on the 10th, and of course Hope08 at the end of August. Then hot off the press we've got Andrew White, all the way from Iraq on the evening of the 17th - definitely not to be missed! But for now I'm just very proud of our young people. Well it's all over! Another fantastic day today. Those of you who can make it in October are in for a real treat. Today started with Craig Groeschel - another leader whose books have deeply impacted me. He leads a church called LifeChurch.TV which gathers over 23,000 people every weekend on 13 sites, but what really impresses me about him is his raw honesty about his own life and just being who he is - have a look at his book "Confessions of a Pastor" I'd you want to see what I mean. Today he spoke on having the "it" factor in our churches, and the reasons why some leaders have "it" and others don't. There was enough in this one session for me to sit in a darkened room for several weeks processing it! Second up was Chuck Colson who as part of President Nixon's government was jailed as a result of the 1974 Watergate scandal. He spoke on the core elements of our faith and how we need to be clear on those. Then on to for me the most inspiring session of the day, with a 31 year old lady called Catherine Rohr. In 2004 she set up the Prison Enterpreneurship Program which teaches business skills to prisoners in Texas and helps them get housing and jobs when they are released. After release only 5% of the prisoners end up back in prison compared to a national average of over 50%. If you want to know what a surrendered life looks like then I'm not sure I've ever seen a better example than this lady. Worth the conference fee on its own! Then a business guy called Brad Anderson who is the CEO of a company called Best Buy. He has built the company on encouraging employees to put their families first and by really listening to what they have to say. Finally Bill closed the conference speaking on living a surrendered life and challenged is to live lives where we say "Here I am, send me" to whatever God asks us to do. Very moving. So a fantastic conference - it's been such a privilege to be here and to be a part of it all. I can't wait for the rest of you to see it so we can work on the implications of it all for us as individuals and as a church. Tomorrow we meet to choose which DVDs to show in Bracknell, then its church at Willow on Saturday evening and up at 5 Sunday morning to get the plane back! Well a totally full on day today. The conference used to be over two and a half days with 10 speakers, but this years its compressed into just two days with 11 speakers - figure that one if you can! I'll give you a brief run down on each speaker. Bill Hybels - has just written a book called Axioms which is the leadership proverbs he has developed over 34 years of ministry - spoke on some of those - brilliant as ever. Gary Haugen - founder of International Justice Mission - a human rights agency rescuing victims from slavery, sexual exploitation, trafficking and other areas of injustice. Deeply inspiring on God's heart for justice and that he chooses to work justice through us - he has no plan B. A number of people have spoken to me about us getting involved in the issue of people trafficking - you wil love what he has to say. For me he was to injustice what Bono was to HIV - a wake up call to be involved. Bill George - Harvard professor and former CEO of a $60 billion company. Spoke on the need for a new generation of leaders focussed on character rather than charisma - a great session for leaders of all ages. Wendy Kopp - founder of teach Teach for America - an organisation trying to eliminate educational equality in America's schools. Probably my favourite session of the day - she was just inspirational as to the difference someone can make if they truly believe in what they are doing and devote themselves to it. John Burke - those who know me will know how much I love his book "No Perfect People Allowed" and how much it has shaped my thinking. Seeing him live only added to my respect for him. He has a new book out - "Soul Revolution" - which I'm wondering whether we might use for our post Christmas series - the 2009 equivalent of 40 Days of Purpose - not sure yet but it does look good. Finally Efrem Smith - leads a multi cultural church in Minneapolis using Hip-Hop to engage the culture. Fantastic on how we have to build churches which culturally represent the communities they are in - very relevant to the journey we are on. So all in all a brilliant day. Can I encourage any leader or aspiring leader who reads this to book into the DVD version of the conference in October - it can only make you a better leader, whether that's at church, in work or in the community. 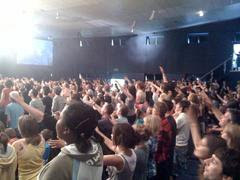 I hear the youth are having a great time at RockNations - keep praying for God to impact them powerfully. Must go now as I've just about lost all feeling in my finger end typing this on my BlackBerry! Greetings from Chicago. 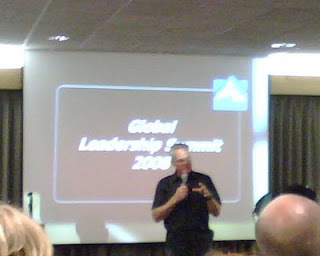 The photo is from a meeting tonight where all the international leaders at the Summit are invited to a reception where Bill Hybels speaks. I chatted to quite a few people I knew from previous events as well as two South African guys, one who leads the Dutch Reformed Church in South Africa representing 300 churches and 300,000 people (or something like that) and the other who has a church of 12,000 people in Soweto - I sometimes wonder what I'm doing at these events! It was very good to be there though, I love Bill's honesty and openness, he's doing the first session tomorrow - can't wait. During the day today Catrina and Mo went to a conference for women leaders hosted by Nancy Beech and Nancy Ortberg - they both said it was very good. Catrina also talked to a lady called Holly Wagner who is from LA and has written a book called God Chicks which some of you may have read. Whilst the girls were there Ben and I went to downtown Chicago and went up the Hancock Tower which is 100 storeys high and is the 4th highest skyscraper in the US. The views from the top were amazing. After this evenings meeting we all went to the airport to pick up Craig Mills from the airport - the Bracknell contingent here is now complete! Please pray for our youth this week as they go off on Wednesday to Rocknations in Bradford. For the past few years our youngsters have gone to the NewFrontiers organised NewDay event, but Lee (our Youth Pastor) felt that they'd grown too comfortable with the format of NewDay and were more excited about the social aspects of the week and the dodge ball competition than meeting with God, so he wanted to do something different this year to challenge them in a fresh way. Speakers include Reinhard Bonnke so they should be in for a great time. 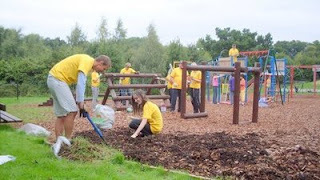 They're also going to be staying in a hotel rather than camping - for some strange reason Lee's found it much easier to find adults helpers this year than in previous years! I thought we had another great Sunday. Tim Felgate left a comment with details on how you can listen to what I had to say on Radio Berkshire on Sunday morning (I can never bear to listen to my own voice, but feel free to listen if you want to), I've had good feedback on my Sunday morning preach on "Reopening the Wells" and people seemed to enjoy the Rob Bell DVD. Loads of visitors on Sunday too which is always encouraging. Off to sunny Chicago tomorrow. 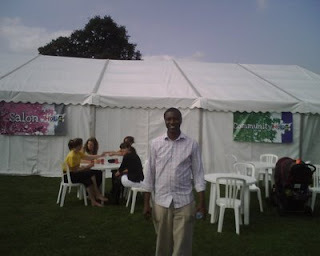 Just a quickie to say that I'm speaking on Radio Berkshire tomorrow (Sunday) morning at 8am on the Clare Catford show. It's only a 20 minute slot, but even that is scary enough! Off to Matt and Hana's wedding in a couple of hours, which will be much less scary. Hopefully the drizzle will stop and the sun will come out before it all kicks off a 1. Hope to catch you tomorrow if you're around in Bracknell. I particularly recommend the Rob Bell DVD we're showing in the evening - I've already seen it but am looking forward to seeing it again.